Makeup and beauty !!! : 4 Maybelline color tattoo 24 Hr Eye shadows ! 4 Maybelline color tattoo 24 Hr Eye shadows ! Today i am up with my 4 Maybelline color tattoo 24 Hr Eye shadows reviews ! Here are the shades ! I have Edgy Emerald, Tenacious Teal,Audacious Asphalt and Bold Gold ! 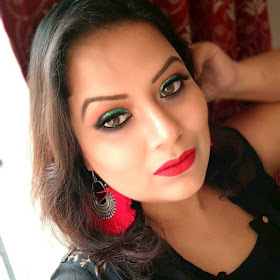 Among this 4 eye shadows i win the Bold Gold one in Rekha's Glitter n gorgeous blog giveaway . Now lets have a closer look on the shades. [oops i forgot to click the bold gold one separately :( sooooooooooorrrrrrrrrrrryyyyyyyyyyyy]. Here are the swatches of the four shades ! Easy available now in many online sites. The creamy texture i found is hard for me to blend. [please note i told that it hard for me to blend but may be it click you ]. Pricey if not available in discount. Do you have any shades of Maybelline color tattoo 24 Hr Eye-shadows? Which shades? Feel free to comment below . These look good ..wanna try them soon! !Thanks for the review! !